CONDUCTING is the art of directing a musical performance by way of visible gestures. The primary duties of the conductor are to unify performers, set the tempo, execute clear preparations and beats, and to listen critically and shape the sound of the ensemble. Conductors act as guides to the orchestras and/or choirs they conduct. They choose the works to be performed and study their scores to which they may make certain adjustments, work out their interpretation, and relay their ideas to the performers. They may also attend to such organizational matters such as scheduling rehearsals. Orchestras, choirs, concert bands and other sizable musical ensembles are usually led by conductors. In Praise of Bernstein as Conductor: Movement That Mesmerized - "To his fans, especially the baby boomers who were the target audience for his Young People’s Concerts, his theatrical podium persona was thrilling." List of principal conductors by orchestra - Wikipedia. The 50 greatest conductors of all time - gramophone.co.uk. ANDRÉ PREVIN - conducting Symphony No.2, Movement 3, (1/3) - by Rachmaninov. Arturo Toscanini - conducting Symphony No. 5, 1st movement - by Ludwig van Beethoven. BENJAMIN BRITTEN - conducting On a Poet's Lips I Slept - music by Britten, words by Shelley. BRUNO WALTER - conducting Symphony No. 2 in D, Opus 73, 4th movement - by Brahms. CARL SCHURICHT - conducting symphony no. 3, Rheinische part 1 - by Schumann. CARLOS KLEIBER - conducting the Rosenkavalier Overture - by Richard Strauss. Clemens Krauss - conducting An der schÖnen blauen Donau, Op 314. - by Johann Strauss II. DANIEL BARENBOIM - conducting Symphony No. 4, 1st movement (1st half) - by Tchaikovsky. ERNEST ANSERMET - conducting Symphony No. 3, Movement 4 - by Brahms. ERICH KLEIBER - conducting Blue Danube - by Johann Strauss II. FABIO LUISI - conducting Symphony No. 6 Movement 1 (1/2) - by Tchaikovsky. Fritz Busch - conducting Don Giovanni K. 527 - by Wolfgang Amadeus Mozart. GEORG SOLTI - conducting Tannhauser Overture 1/2 - by Richard Wagner. George Szell - conducting WalkÜrenritt (Ride of the Valkyries) - by Richard Wagner. GUSTAVO DUDAMEL - conducting MAMBO - by Leonard Bernstein. Hans Knappertsbusch - conducting 9th Symphony, finale - by Beethoven. HERBERT BLOMSTEDT - conducting 9th Symphony, 1/6 - by Anton Bruckner. 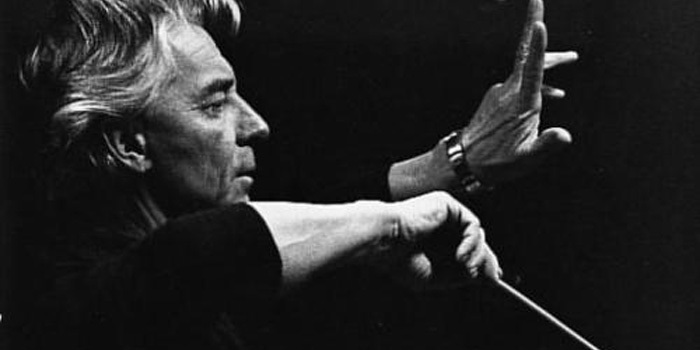 HERBERT VON KARAJAN - conducting Symphony No. 7 - by Ludwig van Beethoven. IGOR STRAVINSKY - conducting LE SACRE DU PRINTEMPS: THE RITE OF SPRING, PART 1. KARL BÖHM - rehearsing 7th symphony, 1st movement - by Ludwig van Beethoven. Karl Elmendorff - conducting Tristan und Isolde - by Richard Wagner. LEONARD BERNSTEIN - conducting WEST SIDE STORY - by Bernstein. LEOPOLD STOKOWSKI - conducting Clair de Lune - by Claude Debussy. LORIN MAAZEL - conducting 5th Symphony, 4. Adagietto - by Gustav Mahler. MYUNG-WHUN CHUNG - conducting Symphony No. 5 in C Minor, opus 67 - by Ludwig van Beethoven. Nikolaus Harnoncourt - conducting Requiem: I. Introitus: Requiem Aeternam - by W.A. Mozart. OTTO KLEMPERER - conducting Beethoven's 8th Symphony, 1st Movement (Part 2). SERGEI PROKOFIEV - conducting Symphony no. 1 'Classical' (1) - by Prokofiev. SERGIU CELIBIDACHE - conducting Bolero - by Ravel. WILHELM FURTWÄNGLER - conducting Symphony no. 1, 5/6 - by Brahms.